CLIMBING up is in built in human nature, though mankind is not blessed with wings like birds. People invented climbing mechanisms to fulfill their desire for moving up or down as necessary. Therefore, stairs are inevitable for modern or traditional architecture. Interestingly, since neither the Greeks nor the Romans were particularly interested in staircases in their villas, and the Medieval Age saw only some rudimentary ladders, it was not until the Regency period in England that the staircase sweeping upward from the hall became a focal point in the house. The last grand period of the wooden-paneled staircase design was the Gothic revival of the late 18th and early 19th centuries. Illuminated by shafts of colored light refracted through stained-glass window panels, the staircase swept heavenward in imposing splendor. Today, however, with space at a premium, the context for such statements would be quite wrong. Generally, there is no hall and all available space must be freed for living - even the spiral stair requires an area of about 6 feet square to allow for wide, comfortable treads. Safety is a vital factor when planning stairs. This is a circulation path. So the width of stairs should be such that it allows freedom of movement. The pictures show a very modern staircase in an individual house. As the members of the household are continually using the stairs to go from one room to another, so it's quite the focal point of the house. Beginning the renovation work, the first thing that was done was to scrape out the old marble from the stairs and the landing space. This was replaced with 'parlato cecilo' marble for the tread and riser of the stairs, with a curved marble beat set as edge molding on the tread. The off-white parlato marble looks really elegant and changes the entire atmosphere of the place. The landing is another important space where people stop to take a breath before moving on. In a duplex house landing also serves as an entrance of a private room. This is a private place, which deserves personal touches to give it a feel of individuality. To continue the flow of the stair, parlato cecilo marble was also used on the landing space, and a 6" maroon marble border was set surrounding the landing floor, creating a refreshing break from the off white marble colour. The railing is the security binder but its aesthetic design can change the total look of the place. A new SS pipe replaced the previous wooden baluster and the newel post. The design is simple, yet elegant. Each step rail contains three piece of etched glass. The previous wooden rail was kept over the handrail. Against the rail, a designed wooden beat was arranged on the wall, in which was set a parallel handrail. The entrance point of the staircase is on the ground floor. There is a spacious door for entering the living room. The door used to be black Thai aluminum. This was replaced by a wood-framed glass door. This door gives the place a cozy, homely look. This door changes the total atmosphere, so that it's no longer just a staircase, or merely a landing. It is a place where individual dreams and thoughts revolve. A glass etching work was arranged in the punch space of dining wall. 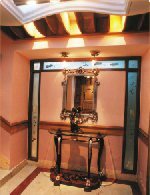 The owner, Sabrina wanted to set a console table with a decorative mirror in the entrance. 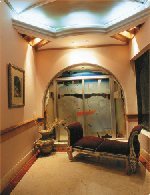 This was done, and a beautiful false ceiling was placed over the console table and the mirror. Decoration pieces were arranged on top of the table, making it a pretty, welcoming entrance. The landing on the first floor was different. This is a resting place for the members of the household. So a cozy sofa was placed there, and beside that, a pinkish rust Indonesian vase. A painting was placed on the stair wall to enrich the place. Behind the sofa is a window, which provides ventilation. So a Thai moving window with decorative mirrors was installed, so that it's beautiful and functional at the same time. Finally, a false ceiling was set over the sofa, with spotlight and other indirect lighting to create a dazzling illuminative effect. According to Sabrina's tastes, we selected a light maroon shade for the wall colour. The wall was painted in two different shades. The lower side of the wooden beat is shaded a little darker than that of the upper side. Aside from the spotlights on the false ceiling, there are also modern chandeliers at the centre of the landing. Designed accent lights are used over the console table. The photographs and painting on the wall are bound to make you stop and look. The whole staircase is such that it makes you take your time to look around and take it in.